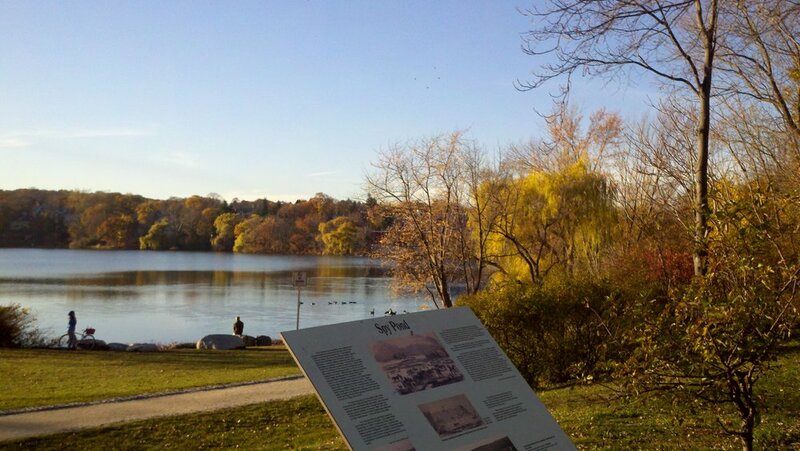 It's pretty well documented on this blog that Fall is my favorite season, but that doesn't mean I don't like Summer. I love the long days, summer thunderstorms, bike rides, sunscreen, pool time, fresh fruit and veggies, hikes and BBQs. Yes, Easter was over 2 months ago. I'm sure it's the last thing anyone is thinking about now, but I'm way behind on posting and wanted to share a few pictures of my pysanky eggs from this year. Some years I struggle to make any eggs worth keeping. Last year was one of those years. I tried several designs that didn't turn out looking as I had hoped. In desperation, I ended up keeping my last egg so I had something to show for my efforts. Each year I like to keep at least one egg. I have 5-6 at any given time displayed on my bookshelf. I replace them if I make one I like better in another year. Is it just me, or does the month of December seem to fly by at warp speed? I wish I had more time to enjoy the weeks leading up to Christmas, but it always seems so frenzied with holiday parties, year end reviews at work, gift giving, cookie baking, holiday movie watching, skiing, etc. Good thing I started listening to Christmas music after Halloween. This year seems especially crazy because I'm getting ready to leave the office for 3 (gasp) weeks! I'm spending Christmas at home with my family and will probably spend quite a few days on the slopes with my brother and sister-in-law, who will be in town. Then, I'm leaving for Patagonia on New Year's Eve. I've been planning the trip for months and can't believe it's finally here...but I still need to buy a few items for the trip and pack. So it will be a busy few weeks, but "good" busy. All that to say that 2014 will be here before I know it. 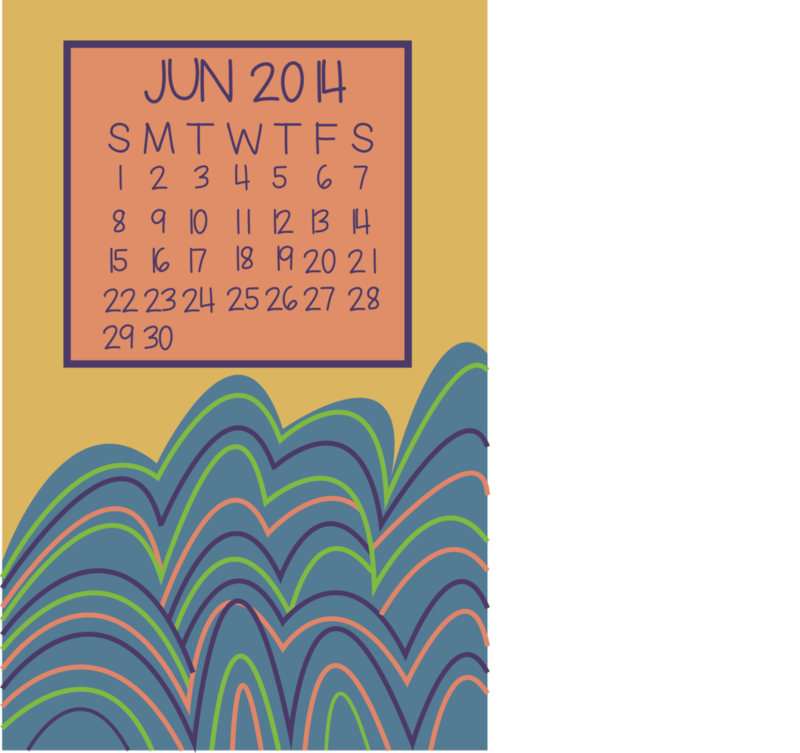 I designed a little calendar for 2014 using Illustrator this year to print and give as gifts to friends and family. It's far from perfect, but I like it and enjoyed picking out the colors and playing around with the design. 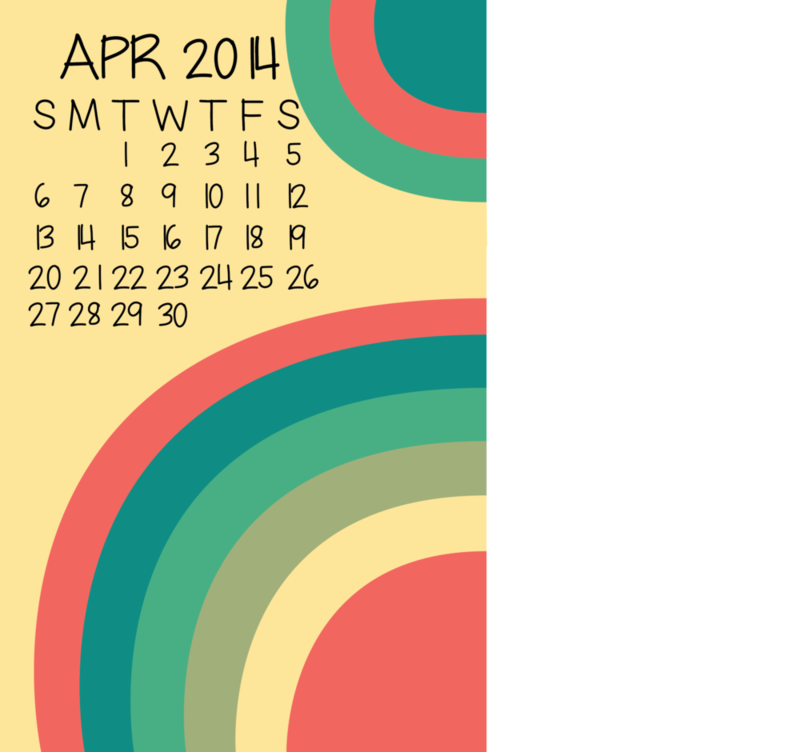 The other fun thing is that I created the font used in the calendar with my own handwriting. I used the app iFontMaker on my iPad. It's really fun to play around with different styles and the one I ended up using for the calendar is pretty close to my actual handwriting. The designs are 5"x8"s and I had them printed on card stock. 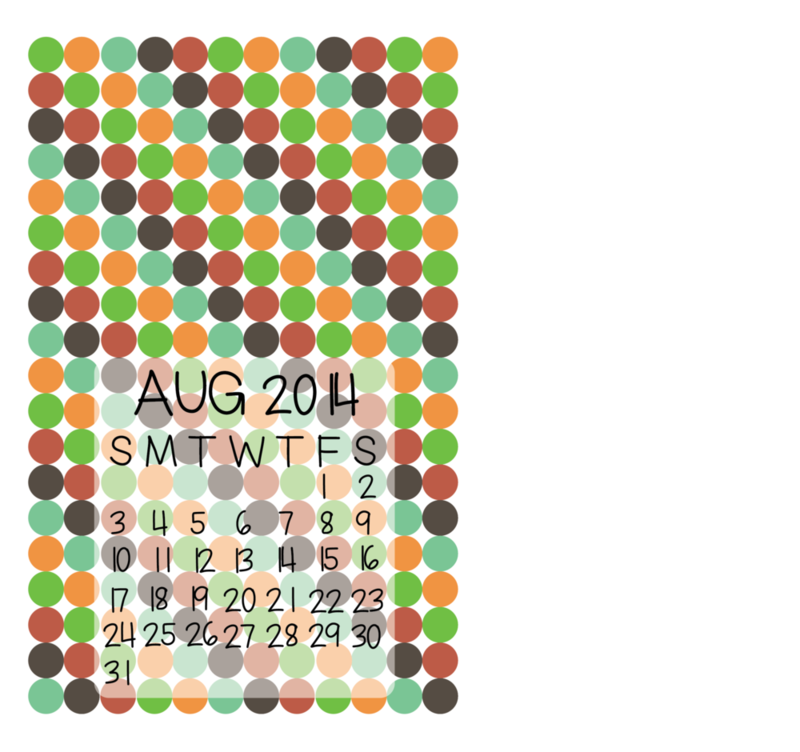 I have a calendar like this that I bought on Etsy last year and it adds some nice color to my cubicle wall. I like having 3 months up at a time so I can see the month prior and the upcoming month. It's always fun when a month ends and I pull out a new month to hang on the wall. The images in this post are some of my favorite designs. If you want to see all them, click on the link below to download the free PDFs for all the months. Feel free to print one out for you or print a lot for friends. Can you believe it's almost August? I can't believe how quickly the summer is passing by. Last weekend, I finally made it to the pool for the first time and the summer is more than half over. I haven't spent much time cooking or knitting lately. I've mostly been retreating from Denver to the mountains whenever possible for cooler temperatures. On July 15th, I finished the Triple Bypass. I had been training for about 6 months to ride from Avon to Evergreen (123 miles and 10,180 feet of elevation gain). The ride was challenging, but fun. The card pictured above is a little thank you note I sent to friends for letting me stay in their house the night before the ride. A few days ago, I hiked up Crestone Peak (elevation 14,294 ft) with some friends. Perhaps it's more accurate to say that I crawled up Crestone Peak. It was the hardest 14er I've climbed and required lots of scrambling up and down rocks. At one point, I almost slid off Crestone Peak. While scrambling up a smooth and steep rock face, I accidentally put one of my feet in a stream of water. It caused me to lose my grip on the mountain and I slid down the rock for about 15 - 20 feet before finally being able to stop. It was scary and gave me some bumps, bruises and scrapes. Thankfully, nothing worse happened and I continued the climb without injury. I've been limping around for the last few days with very sore legs. So, this weekend I'm staying inside. I'm planning to bake a blueberry pie. I'm going to knit and catch up on my reading. It will be a glorious weekend with no activity. PS. I'm going to be launching a little contest in the next few days through my email list for those of you who are subscribed. Keep an eye out for the email or subscribe if you haven't already! If you still need some last minute gifts, here are a few ideas for the foodies and bloggers in your life. Instead of heading to the mall, why not stop by the grocery store and make some holiday sweets for your friends and family. Melt in the Mouth Cookies are a Christmas favorite in my family. The best part about these is that they're so easy to make and you probably already have all the ingredients you need in your pantry. Cranberry Lemon Sconeswould be the perfect treat with some coffee on Christmas morning. These scones have the perfect blend of tangy and sweet. Do you have someone in your life that loves to blog? Are they still using a wordpress.com or blogspot blog? Why not buy them their own personal URL and hosting so they can own their own space on the web? Bluehost(affiliate link) makes hosting and domain purchasing easy. It’s especially easy for those of you who want to create WordPress websites. The installation couldn’t be easier. They also have amazing support and live chat for questions you have. Once you buy them a domain name, they'll need an easy Wordpress theme to customize the look and feel of their blog. My favorite premium theme is Headway Themes (affiliate link). I have tried many premium themes and Headway surpasses them all. I use it on this site and a few others that I own. If you want to design your own theme with minimal coding, this is the theme for you. It takes a little bit of time to become familiar with the interface, but once you do the possibilities for website design are endless. Good luck to everyone as you finish up last minute details for the holidays! I'm off to tackle my to-do list! Thanks to everyone who entered the birthday giveaway! I'm excited for the next year ahead of blogging with all of you. The winners of the free pattern are: Jennifer, Marie, Diane Baldwin, Lynn and Diane. Two years ago, on September 1, 2009, Painting Lilies was born. Today is my blog's 2 year anniversary! I first created the blog's concept in April 2009 and took my time learning to create Wordpress sites, HTML and all the other fun aspects of blogging. The name Painting Lilies comes from Shakespeare's King Lear (Didn't you know I was a nerd? Well, you do now...) On September 1, 2009 I finally bit the bullet and published my first post, a crocheted blanket for Quirk. Readership has grown steadily over time with the most unique visitors coming in August 2011. Thank you to all 13,895 readers out there who stopped by in August! Enough with the statistics...what are the prizes and how do I qualify? 5 copies of my yet-to-be-released baby blanket pattern. This pattern is still on the needles, but will be finished soon (I promise) and the PDF pattern will be yours for free as soon as the PDF is created. The pattern is called the Sand Cable Baby Blanket. And I think you'll like it! Make sure when you Tweet to include my handle @paintthelily, so I see your Tweet! Add me as a friend and tag me when you share the link! Are you on the newest social media network? If so, mention me and share this post with your circles! Next Thursday, September 8th, I'll put all the entries (maximum of 4 per person) into a spreadsheet and use a Random Number Generator to select the winners. Thanks everyone for reading! When I started this blog 2 years ago, the 75 visitors I had in my first month were probably all my close friends and family. Two years later, I had over 13,000 people visit. Thanks for reading, for returning, for sharing and for being a part of the blogging community here with me! 1. Made Strawberry Leek Quesadillas (with goat cheese) They are delicious and a great summer meal. You should make them. 2. Had the staples removed from my foot! And my burns are healing nicely...finally! 3. Learned that glass must be heated slowly or it explodes. Apparently thick glass is worse than thin glass since it heats unevenly, causing it to break. Pyrex is specifically designed not to break. Glass can withstand high temperatures when heated slowly and evenly. 4. Was reminded that visits to the ER are not only painful, but also expensive. 5. Dog sat the most adorable little dog in the world. Meet Rascal. 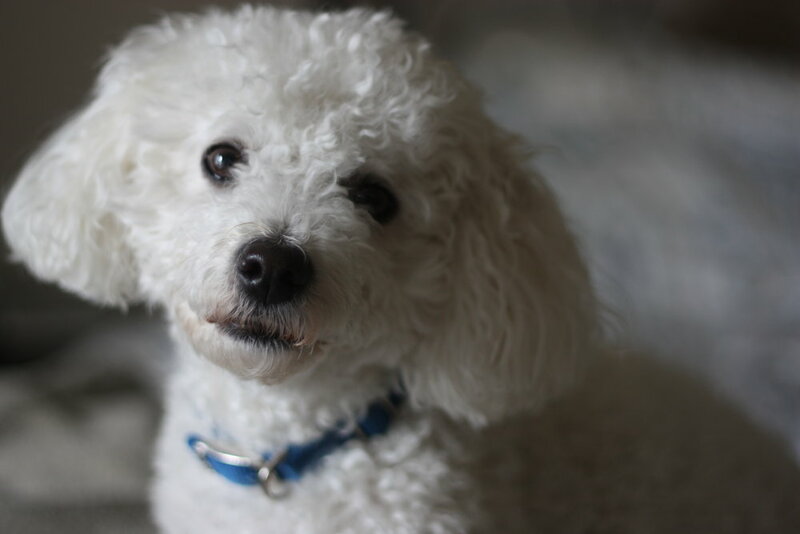 I miss him already...reminded me so much of the little Bichon I had growing up named Peaches. Yesterday was my golden birthday. I turned 28 years old on April 28th. Leading up to my birthday, I had all sorts of ideas about having a big celebration or party or taking a trip to mark the Golden Birthday. But all of the work and life transitions I've been dealing with lately made me forget about the Golden Birthday plans. All of a sudden, the day was upon me with no grand celebrations, so I decided to celebrate in a slightly different way. Read Psalm 28 (done @12:08AM) I thought verses 8-9 were especially birthday appropriate, "The Lord is the strength of his people; he is the saving refuge of his anointed; Oh save your people and bless your heritage! Be their shepherd and carry them forever." Close my eyes and take 28 deep breaths (done @8:52AM) I should start off every morning with these deep breaths. Donate $28 to my alma matter (done @10:34AM) I think this is one of my favorites from the list. The school is always calling me for donations. I'm pretty sure it's towards the smaller end of gifts on the giving spectrum. Drink 28 ounces of liquid (done @2:33PM) I thought I would drink 28 ounces of my favorite liquid, but it didn't seem realistic to drink that much wine or coffee. I drank gatorade, instead. It isn't one of my favorite liquids, but it's pretty amazing when biking. Bike 28 miles (done @3:15PM) The weather was perfect for biking--70 degrees and sunny with no wind. After biking 50 miles last week into 50 mph winds, this ride felt easy. I may have swallowed 28 bugs along the way (picked a few out of my teeth), but that's unconfirmed. Eat 28 raisins (done @3:20PM) I originally planned to eat jellybeans, but I didn't have any and raisins sounded better after my bike ride. Take a 28 minute shower ( done @4:38PM) 28 minutes in the shower is a LONG time. The water wasn't cold at the end, but it wasn't hot anymore, either. Do 28 situps (done @9:28PM) Originally, this item was "drink a $28 bottle of wine". I intended to buy a bottle or drink one at dinner, but we ended up buying a more expensive bottle and who am I to refuse a better bottle of wine? Knit 28 minutes of my latest knitting project (done @11:28PM) Initially, I planned to knit 28 rows. However, I neglected to remember that one row of my current project takes about 10 minutes to knit. I just didn't have time for that many rows. Watch at least 28 minutes of TV (done @11:36PM) I watched last night's episode of Bones. Thanks to my friends and family who indulged me in my quest to celebrate 28! Sarah, who emailed me 28 things she appreciates about me. Carmel, who g-chatted me HAPPY BIRTHDAY 28 times. Marla and Ruth who texted and called to see how my quest was going during the day. Liz, who sent a cute card all the way from Romania. My brother, who called to wish me a happy birthday from his ship where he is deployed. My mom, who gave me a necklace with diamonds (my birth stone) and gold (for my golden birthday). My parents, who took me out to a nice dinner. Carmel and Sheree, who helped me come up with all the items on my list. One final request? If you're reading this, help me by commenting on the post and maybe if I'm lucky, I'll have (at least) 28 comments! 1. In March, it seemed like a good idea to knit a baby blanket with size 5 needles and sport-weight wool. Nearly two months later, I'm wondering if I'll ever finish it. The pattern is coming out nicely (I designed it myself! ), but maybe I should have picked a thicker yarn and bigger needles. Oh well. I'll keep plugging away at it and will share the pattern here when I finish. 3. 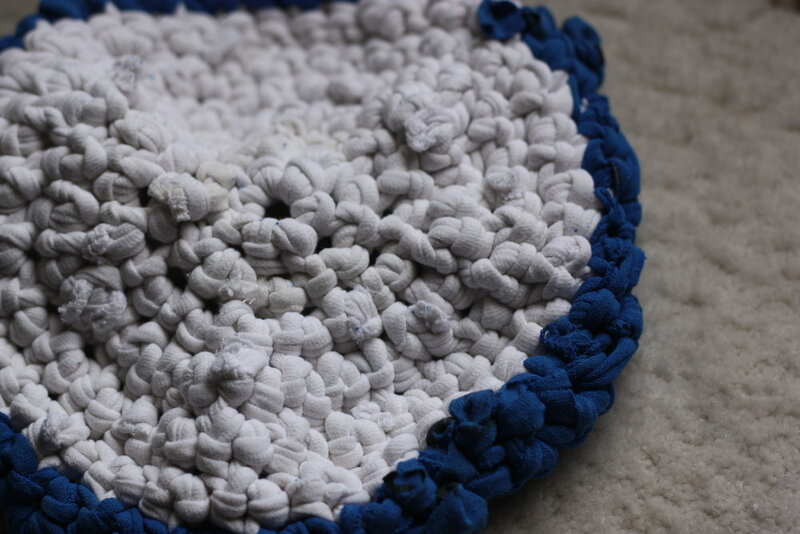 Instead of making t-shirt yarn, maybe next time I 'll try to make one of these cool looking t-shirt bags. Most of these t-shirt crafts tell you to use old t-shirts. The problem is that all my old t-shirts are really gross and have stains. (see above) And I don't want to cut up a t-shirt I like and use. Does it still count as recycling if I buy t-shirts for these crafts at the thrift store? 4. Speaking of t-shirts, I really want this Atlas Shrugged shirt. It's one of my favorite books. I haven't seen the movie yet, but how cool would I be if I showed up to the movie wearing this shirt? Ok, I would be totally nerdy. 5. Easter is so late this year, but it has still managed to sneak up on me. I'll be posting some pictures of my Psyanky later in the week. My unsteady hand needs to get used to the feel of the kitska and the flow of hot wax. Does it sound like I'm speaking a foreign language? I am. Psyanky are Ukrainian style Easter eggs. 6. I also plan to bake paska this weekend. Paska is a Ukrainian bread that is made with LOTS and LOTS of eggs. It's delicious and sweet and I'm getting hungry typing this as I think of it. 7. I'm 25% Ukrainian. These Ukrainian Easter traditions were passed along from my great grandmother (who immigrated to New York from the Ukraine) to my mom to me. They are traditions for women only, which explains why my brother never had the patience to create eggs as a kid. 8. Do you have a few hours to kill? If so, head over to Craft Gawker. If not, go there anyway. It's a great place to find artistic inspiration, tutorials and new blogs to read. You can view my submissions, too! 9. Do you use Evernote? I can't say enough good things about it. I don't know how I organized my life before I started using this a few months ago. I use the desktop software on my personal computer, the web-based interface on my work computer and the Droid App when I'm on the go. Best of all? It's free! To read lots of books. Accomplished! I read 42 books this year. To take a picture every day. Accomplished! This was a huge undertaking, but I love going back and reviewing my year in pictures. It challenged me to look at my days in a new way. I love how it captures my travels, the mundane, the exciting, the little things and the big things. I'm planning to print the photos and put them together in a scrapbook. I'm still on the fence about whether I'm going to do this again in 2011. I loved the project, but I might be a little burned out on it. In July, I posted my favorite photos from the first six months. My full 365 days of photos are on Flickr. Below are my favorite pics from July - December.